The Microbotics MBX1230XA, or Paravision M1230XA, is an 68030-powered accelerator board for the Amiga 1200 computer that connects to the Amiga 1200's internal "trapdoor" expansion port. It has one SIMM slot for up to 128MB of RAM (72pin SIMM, FPM, non-ECC, 40-100ns). EDO RAM is not officially supported, it's not mentioned it the manual, but user reports indicate that some EDO SIMMs work, and some don't. It has a socket for an optional 68882 FPU (PGA, up to 60Mhz) with a socket for an optional FPU oscillator (otherwise uses CPU clock speed, via jumper setting), and a battery backed up realtime clock. The software supplied with the M1230XA contains an excellent setup utility that allows some tweaking, and an equally excellent RAM test tool with proper documentation. These accelerator boards are very well-made, but seem to be very rare nowadays, making it difficult to find information and support in case of problems. Below is a list of sources that should help answering your questions about the M1230XA and keeping it running. 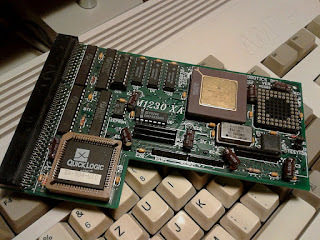 "Microbotics MBX1230XA / M1230XA Amiga 1200 accelerator board"
"Microbotics 1230XA -- 68030 Accelerator for the Amiga 1200"
"Usenet Review: Microbotics 1230XA Accelerator for Amiga 1200"
Do you have a M1230XA, and have more information? Please leave a comment below, and/or join our facebook group! i preview the blog.its very easy to read your blog and its much better to refer.thanks to this blog.